When Shadows Call is a novella by Amanda Bonilla and belongs in her Shaedes Assassin series. Basically, it’s a prequel to Shaedes of Gray, the first book in the series. As a companion book, it is absolutely wonderful. The series is told in a first person perspective, from Darian’s point of view. Darian shares memories with readers in Shaedes of Gray – memories about her past and her life before and as she became a shaede. These are really interesting parts of the story and really help us relate to and care for Darian. When Shadows Call is basically these flashback memories only on a broader scale. We learn a bit of Darian’s life before she met Azriel and the abuse she suffered from her husband Henry (whom I hate even more after reading this novella). We see the day she met Azriel in 1912 and the day she was saved by him. And we witness her transformation into a shaede. I love how Amanda kept true to the novel and kept Darian believing that she was turned by Azriel. We find out in the full length book that that is not entirely true but Amanda ‘plays along’ keeping the details consistent. There is no gap between the novella and the novel, and by that I mean they go together perfectly and not once did I find myself focusing in one detail and wondering if it was in fact the same as what we learned in the full book. We also follow Darian in her first few days as a shaede and we see her fifteen years later, in 1927, when she asks Azriel to help train her to make her strong. Even after all that time, she still feels helpless thanks to what Henry did to her during their marriage and seeing her fight for the first time is awesome. Even back in the day when Darian is a proper lady acting all demure, you can still see that there is some fire in her. And even though you can feel that Azriel is a bit of a slime, I feel he is good for Darian at that time. He helps her feel wanted. He helps her feel strong. He helps her become who we see in Shaedes of Gray, the good and the bad. This novella just helped me appreciate Darian and what he has gone through even more. You could read this novella as a standalone but I would not recommend it. I feel you should read Shaedes of Gray first then go back to read When Shadows Call. I think you will get a better feel for it that way and you will definitely gain a new heightened admiration of Darian by reading them in that order. Yes, she is a messed up character and yes, she has some growing to do but she’s strong and devoted. She is now and she was even then. Any fan of the Shaedes Assassin series MUST read this novella. Absolutely must. 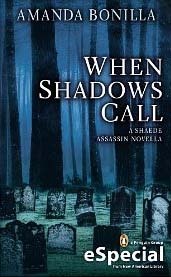 Share the post "Review: When Shadows Call by Amanda Bonilla (Shaede Assassin #0.5)"
Oh I’m jealous! I really need to read this one, I LOVE the series! I’m so glad this one is amazing, I’m curious to learn more about her past like that. I haven’t read this series…. UF, I’m only starting to read. Nice review Julie, I am still a bit hesitant to start this series though. I’ll be reading this one soon… very soon.